Palestinian leader Mahmoud Abbas has signed papers to join the International Criminal Court (ICC). He signed the Rome Statute, the ICC's founding treaty, at a Ramallah meeting. Membership could see the Palestinians pursue Israel on war crimes charges, and the move was quickly condemned by Israel's prime minister. It follows the rejection of a UN Security Council resolution demanding an end to the Israeli occupation of the Palestinian territories by late 2017. Eight members of the 15-strong Security Council voted for that resolution, while the US and Australia voted against. The resolution, condemned by Israel as a "gimmick", needed the support of at least nine members in order to pass. The Rome Statute was among some 20 international agreements signed by Mr Abbas at the meeting in Ramallah, in the West Bank. Signing up to the statute is seen as the first move to joining the ICC. "We want to complain. 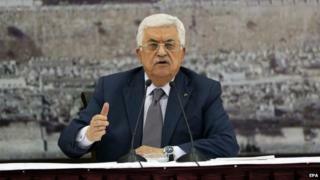 There's aggression against us, against our land," Mr Abbas was quoted as saying. "The Security Council disappointed us." Israeli Prime Minister Benjamin Netanyahu responded quickly, saying Israel would take "steps in response and defend Israel's soldiers". Israel, which is not a member of the ICC and does not recognise its jurisdiction, says joining the court would expose the Palestinians to prosecution. "It is the Palestinian Authority - which is in a unity government with Hamas, an avowed terrorist organisation that, like ISIS, perpetrates war crimes - that needs to be concerned about the International Criminal Court in the Hague," Mr Netanyahu said in a statement. The US state department released a statement condemning what it called "an escalatory step" on the part of the Palestinians, saying negotiations between the two sides were the only "realistic path" towards peace. "Today's action is entirely counter-productive and does nothing to further the aspirations of the Palestinian people for a sovereign and independent state," it said. Palestinian chances of joining the ICC were improved in 2012 after the UN General Assembly voted to upgrade their status to that of a "non-member observer state" in November of that year. Membership is not guaranteed but correspondents say the application is a highly political move that carries great symbolism. Less than 24 hours after the Palestinian Authority failed to bring about a UN vote to end the Israeli occupation, President Mahmoud Abbas has made good on his promise of a different approach - joining the International Criminal Court, and threatening Israel with charges of war crimes. Instead of negotiating his way to statehood, he hopes that pressure from international bodies will bring it about. It's been a bloody year for Palestinians and Israelis - the war in Gaza, kidnappings, and murders in Jerusalem. There's little hope of peace. Internationally, there is a growing sense of frustration that bilateral talks have made little progress. The last attempt at peace negotiations, led by the US Secretary of State John Kerry, collapsed earlier this year, having achieved almost nothing. Mr Abbas had been under increasing domestic pressure following months of heightened tension and violence after the collapse of peace talks in April. More than 2,100 people, mostly Palestinians, died in a 50-day conflict between Israel and Hamas in the summer, according to UN figures. Israel said 67 of its troops and six civilians died. Analysts say signing the Rome Statute could stir up tensions with the US and other major donors to the Palestinian Authority - as well as a response from Israel. Based in The Hague, the ICC can prosecute individuals accused of genocide, crimes against humanity and war crimes committed since 1 July 2002, when the Rome Statute came into force. Earlier this year Mr Abbas signed applications by the "State of Palestine" to join 15 UN treaties and conventions, beginning with the Fourth Geneva Convention.